Ok, so you got yourself a new car. Spanking new and hope that your car registration number will strike the first prize on Da Ma Cai, Sports Toto and Magnum 4D within the same weekend. On the other hand, you also secretly hope that it will give you a safe ride, free from accidents and never give problems. Even amongst Catholics, I have seen many people taking their new cars and asking the parish priest to bless them. The priest merely say a few words and give the car a cross action. No spraying of holy water kinda of drama lah. When I had my Naza, I did asked my atm should I call out Father Stephen from his cosy office to the car park to bless it but my dear atm said,”Haiya…what for, no need wan, God sure bless me with 4D wan. He knows already.” So I dropped it. Some people likes to put stickers of their faiths. Some put doa selamat. Some put “Jesus loves you”. 🙂 Some have Sai Baba. Some have the three Buddhas. Some got elephant god. Some hang rosary. Some hang wooden beads. Or hang some golden/orangey clothes and other talisman. Well, from the experiences, we did certainly own some cars that are totally, totally ‘suey’. Bad luck. We used to have one Nissan Sentra that got into so many accidents, broken windshield, knocking down one poor, old auntie into the rubber plantation drain! (my atm droved with his Italian colleague, not my fault), getting into bumper to bumper crash on the Penang Bridge (five vehicles) and we finally sold it off. When we go on outstation rides, my children and I do say a loud prayer for a safe and smooth trip. Usually, we will passed by our church on the way to the Penang bridge and we will asked, “Heavenly Father, Please see that we don’t get saman (summons), no red lights all the way, no kopi polis and have a safe and happy journey.” Once, we travelled during the hungry ghost festival to Pulau Redang at 1 am in the MORNING! I took my rosary along and put in at the dashboard. Don’t play-play, wei. I don’t want a green face staring at me on the windshield when we are somewhere in Pengkalan Hulu. After five paragraphs, only I am getting to what I want to write. 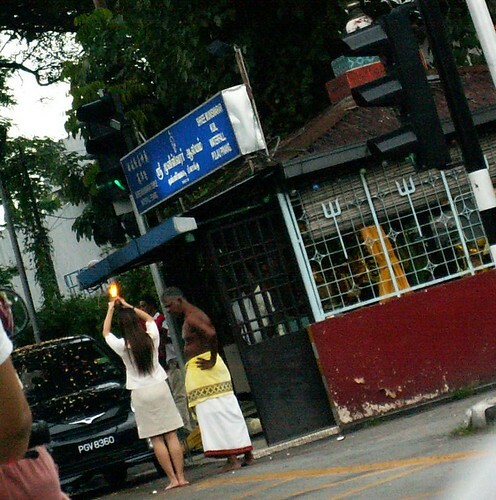 Now, in Penang, we have this little Hindu temple on the way to the Botanical Gardens. 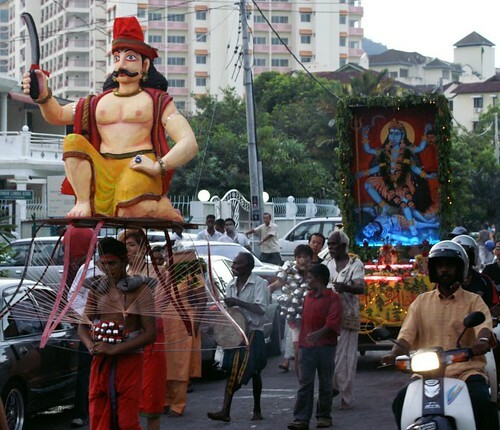 The Hindu god has a very fierce look with a huge sword in his hand. A lot of Chinese bring their new cars to be blessed. In fact, every evening, there are like 3-4 cars waiting to be blessed. 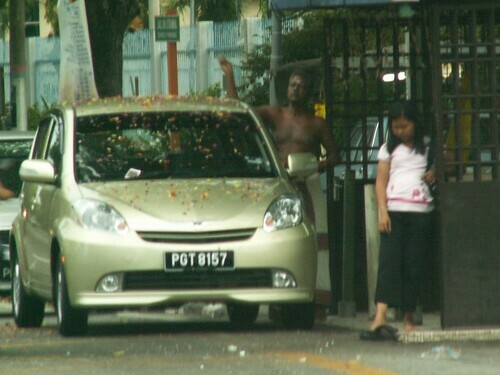 The ritual is the person will hold a coconut with joss-sticks high up and then, throw the coconuts on the ground to crack it to bless the car. The temple has a statue of this Hindu god. The one holding a sword. According to urban legends, this temple is very, very ‘sneah’ (as in all your wishes granted) and whatever you prayed for, will come true. So, one day, there were these two guys on motorbikes who passed by the temple. One of them make fun of the god and guess what? The guy died in an accident the next day. See? You have been warned. Don’t crack funny jokes, ok? And since it is the weekend, I give two lucky numbers for your Da Ma Cai. 8360 and 8157. Don’t gamble. I say, don’t gamble. You hear me anot? say all you want….me no buy number…what for ? SO what if you strike huge …then ? still keep on buying and in the end….the odds is against you. i oso got DMC number for all ur readers…. 6367…kena bad accident in PJ yesterday. i repeat after aunty hor…don’t gamble…i say don’t gamble! i also give number!!! 6699!! and 6967! wuah that god so fierce wan, make fun & u die! not a good god leh…ok, i oso have number to give 6969, sama like wingz but ‘bao’ the number lah! Wanna get ur new car blessed. Come to me, i’ll get Gordon to pee on it, hahaha. Very “omg” wan, u’know, tung ji liu. 10 minutes after I collected my car 1226, I met another fellow new Myvi same colour of 1716 on the road and then 30 mins later, another new Myvi of same colour too of 1708.